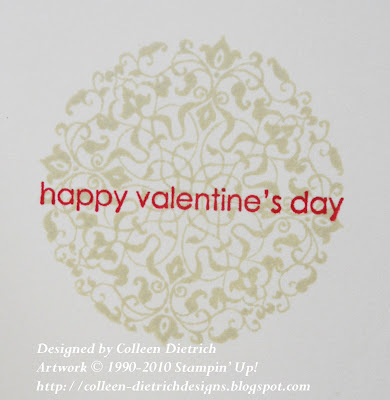 I had just received some of my new goodies from Stampin' Up! 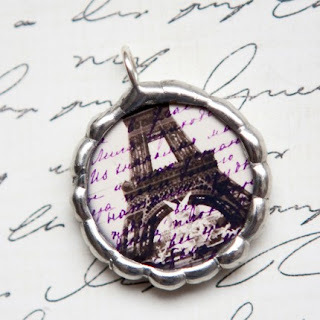 on Monday, and a stamp set called Artistic Etchings contains both a crown AND an Eiffel Tower! How cool is that? So that is how my card came together. Edited to add: I stamped an Eiffel Tower twice on my handmade designer paper, but after assembling the card you can't even see it! Boo hoo. I have some close-up shots so you can see my homemade designer paper, using a variety of stamps and inks. 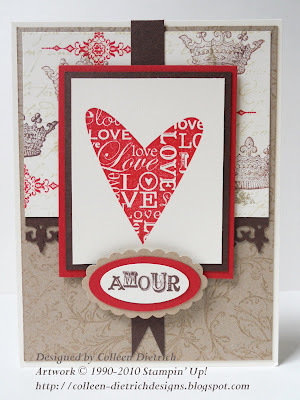 The Filigree Background stamp, using Versamark ink. The simple inside of the card. I love how the sentiment fits perfectly in the circular flourish! 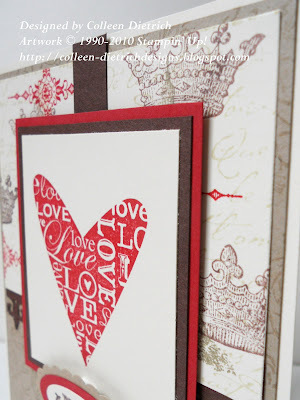 I finally got a chance to use one of my new-to-me free stamp sets from that awesome Stampin' Up! sale recently, A Happy Heart. I'm lovin' that large heart! I do hope you have enjoyed my Valentine. I'm way early on that, but at least my hubby's card is done now! OH, I can completely understand why you went with your "Yummy Valentine" title, Colleen. Those color names have made me SO hungry!! Wow, you did a fab job of combining SO many great challenges here. Aren't those charms at Cathy Walters' Etsy store fun? [AND inspiring!! I've gotten a lot of mileage from them this week :) ] Love how you used your new Artistic Etchings set from SU--those images are FAB! Good for you for getting a head start on Valentine's Day. Must strike while the iron (or idea, at least LOL) is still hot. Love it, Colleen!!! Yahoo, Colleen! THis is AWESOME! 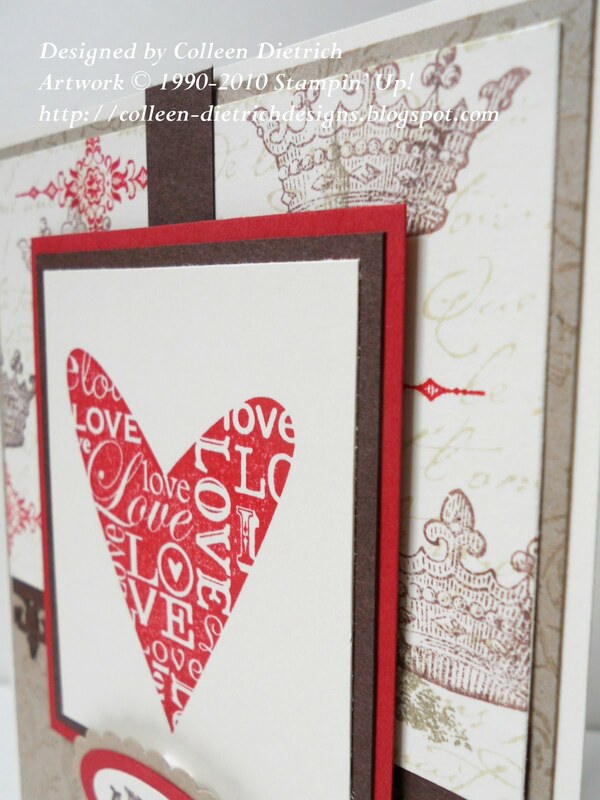 What a sweet, sweet Valentine card--perfect sketch, great use of all the images! LOVE it! 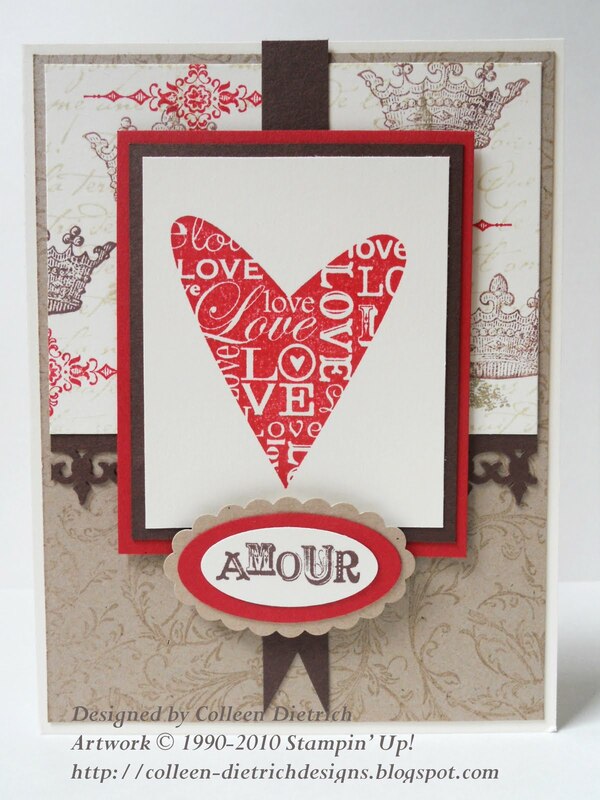 Love how all of the images work together in your design ... fantastic inspired card. 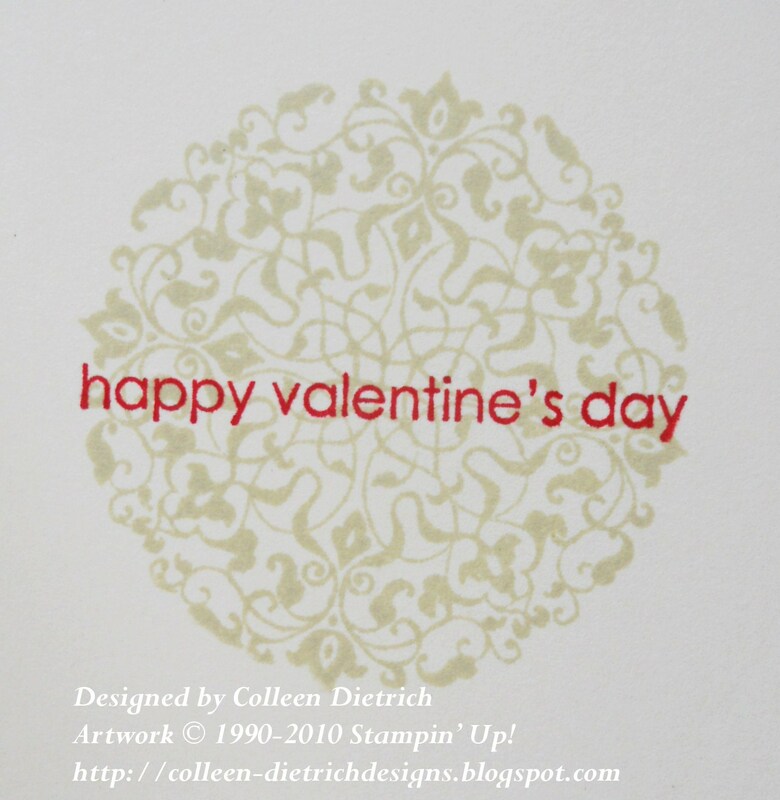 Love your hand-stamped designer paper! Wow! Great job with the challenge colors and the Mojo sketch! Thanks for joining the Paper Players challenge! This is gorgeous! 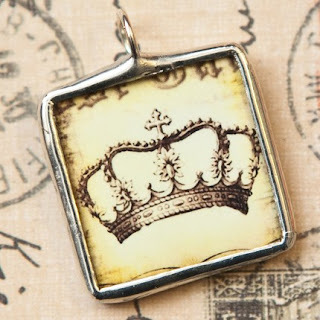 I love the heart and crowns! Thanks for taking the time to play along with the EtsyInspired challenge this week, it means a lot to me! Stunning card, and I can't believe how you tied all those challenges together, seemlessly! This is so so pretty.. Thanks your for playing along with us at CCCB! Love the pattern paper you created! That red and kraft combo is STUNNING! Beautiful job! Just beautiful Colleen! I love your stamped background; fab job with the sketch! Your jewellery pieces are awesome! 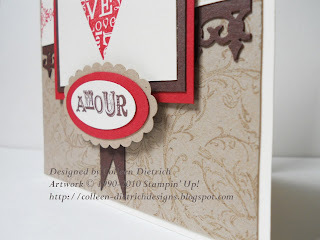 I think this is a stylish valentine card, I love when you go out of the box and use this color combo, it is pretty neat! Thanks for sharing it with us at CCCB! Beautifully done all the way around Colleen! Love the combination of sets on the card...and the charms are just gorgeous! Colleen, just a gorgeous card. I love your DSP. I love the fact that there is so many interesting things going on and yet the focus never goes away from the central heart and that the lines are still so clean and simple. Beautiful job with the challenge. Absolutely gorgeous!! Couldn't love it more! This is just beautiful! Thanks for playing Mojo Monday! This is exquisite. I love this sketch. You have done it up perfectly. GIRL! You've only been blogging since June? WOW. Your blog and photos look amazing. Creamer AND Cherries in One Week?! I Won at the Midnight Madness Sketch Challenge!